If you were to believe what Donald Trump has been tweeting, and what Roger Stone has been posting on Instagram in response, you’d think the two couldn’t be any more in lockstep when it comes to the Trump-Russia scandal and investigation. But Stone just screwed up and made a really stupid admission that paints the entire thing in a different light. By now it’s been well established that Donald Trump has joint criminal defense agreements in place with dozens of his current and former associates who are caught up in the Trump-Russia scandal. This is not a secret; Trump’s side has routinely acknowledged as much. It allows Trump and the others to share information with each other about the scandal, and plot a coherent defense strategy. Here’s the kicker: it doesn’t include Roger Stone. Roger Stone publicly admitted today that he doesn’t have a joint defense agreement with Donald Trump, according to CNN. Stone is a frequent liar, but if he were to lie about this, he would be pretending he does have one when he doesn’t, not the other way around. So in this instance he’s almost certainly telling the truth. There are only two plausible reasons why Stone wouldn’t have a joint defense agreement with Trump, when everyone else in Trump’s orbit does. 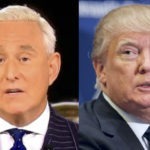 The first would be that Donald Trump wants nothing to do with Roger Stone at all, to the point that he isn’t even interested in receiving information about the scandal from Stone’s camp. The second would be that Stone doesn’t want an agreement because he’s looking at a plea deal against Trump. Either way, Stone should not have admitted this. So what’s going on here?